Search engine optimization or SEO for appliance repair businesses is still a very important part the appliance repair marketing puzzle. In fact, many of appliance service company owners see amazing increases to their bottom line revenue numbers within a short period of time after implementing effective Search Engine Optimization strategies. 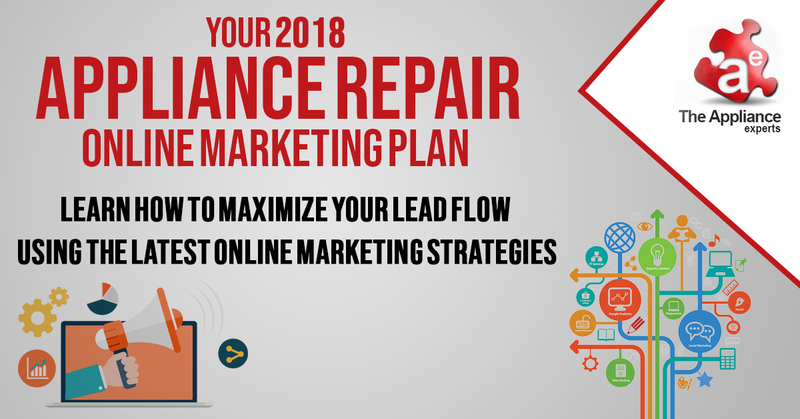 In this webinar, Marlon outlines the 2018 Appliance Repair SEO formula that we are currently using to generate hundreds of leads each month for our existing clients. There is nothing sold on the webinar, the webinar is designed to educate appliance repair business owners and managers about the current SEO strategies that are working in 2018 to get your appliance repair website to rank at the top of Google and all the major search engines. How to increase the authority of your appliance service website so that your website pages will rank higher in the search engines. How to get relevant links for your website? 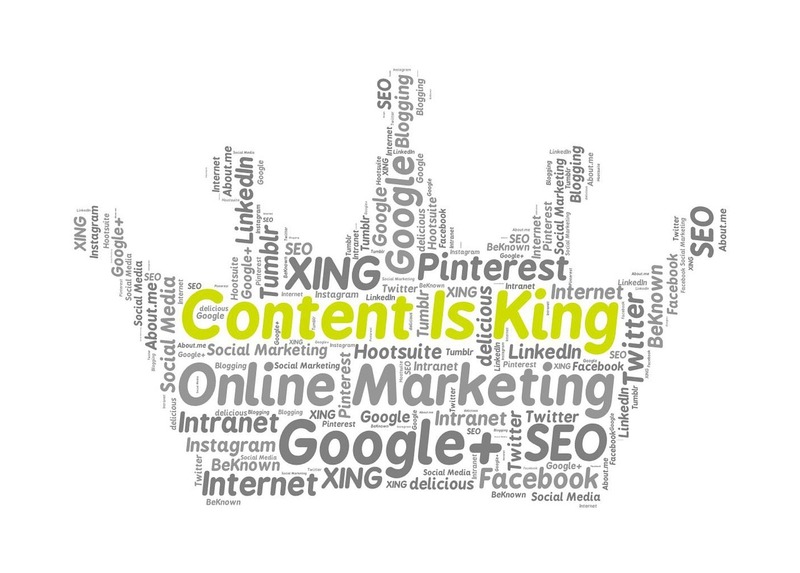 Why duplicate content may be hurting your rankings? 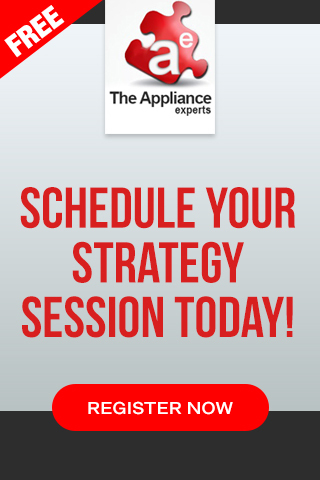 What are the most important online directories that you should list your appliance repair business in in? Are bad links holding your website back, and how to get rid of them? 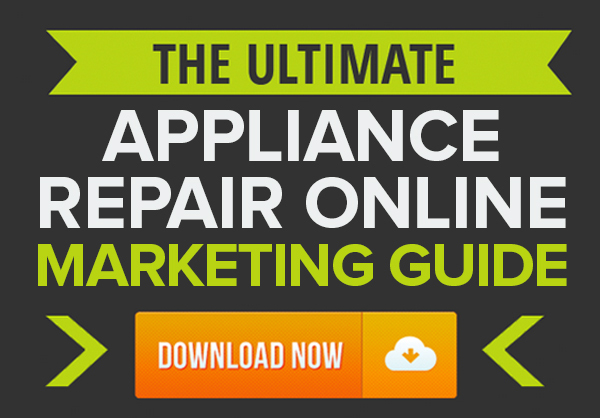 What are the most important Appliance Repair Keywords that your website should be targeting? Can I still use fake addresses if I want to rank in the Google Maps? Which online review sites are the most important? 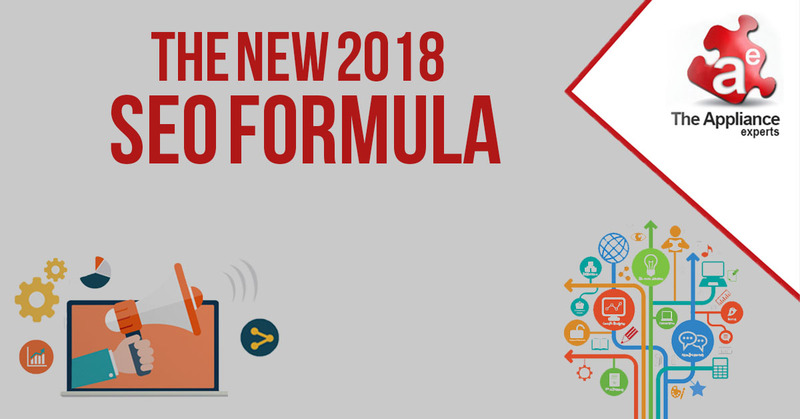 Today we’re going to discuss the new 2018 formula. The SEO landscape is forever evolving, and typically, when we’re talking about SEO strategies, we’re primarily focusing on the Google search engines versus Bing and Yahoo. That includes YouTube which is also considered to be a search engine. The reason is because Google does have about 80 percent of the market share. So primarily that’s what we focus on as a company when we generate appliance repair leads for our clients using SEO. And because it’s ever-changing, it’s something that we try to stay on top of. That’s why we created this webinar for you today to help keep you updated on what’s going on with SEO and help outline some of the things that you should be focused on if you are doing any type of SEO strategy. 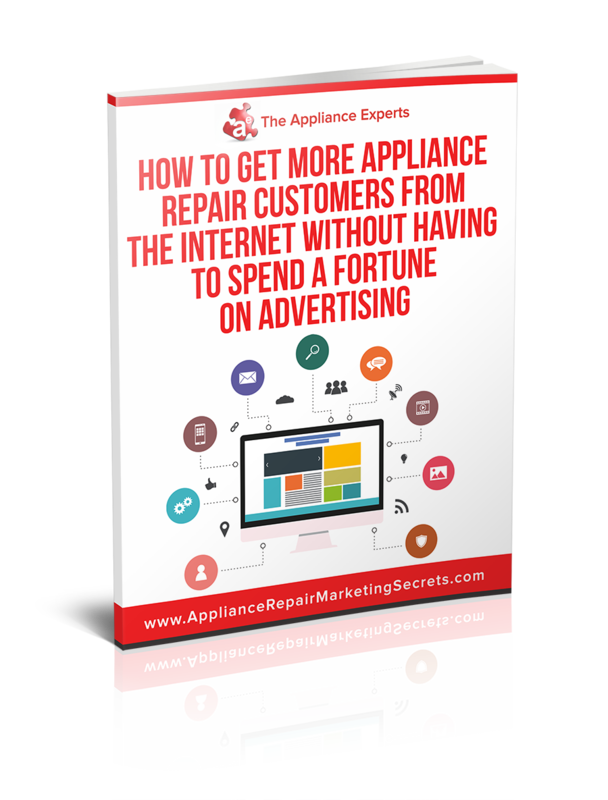 This is part of our 2018 appliance repair online marketing series of webinars. We did a webinar last month regarding this which was more of a high-level type webinar where we went over the different things that you should be implementing as part of your online marketing strategy. But we didn’t really go in-depth on what you should be doing. 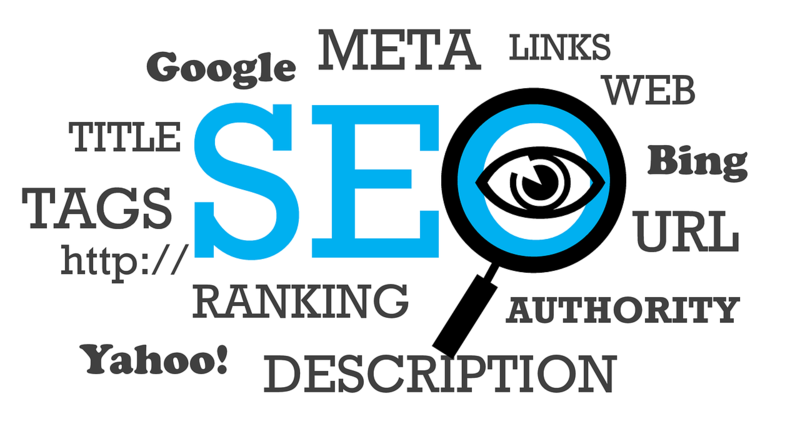 Search engine optimization is primarily what we’re focusing on today. Then we’re going to have some additional upcoming online marketing webinars over the next few months. That’s when we’ll go into some of the other different strategies like pay per click advertising and website conversion. If you were on the last webinars you probably saw the image below, which is what we consider to be the online dominance blueprint. If you want to dominate your local service area, then you should have all or a majority of these different sources of online advertising so that you’ll have a consistent flow of new appliance repair leads coming in. So what exactly are we going to be covering today? We’re going to cover the latest updates with the Google algorithm, the things that you may have put in place in the past that could be hurting you right now. We’re also going to talk about how to optimize your website using the new appliance repair SEO formula. Does Search Engine Optimization still matter? I get asked this question all the time. There are some gurus out there and some blogs that will say the SEO is dead and that it no longer works. Maybe you have experienced that, where you’ve tried it on your own, and you just don’t seem to get any results. Well I’m here to tell you that we use it every day to generate hundreds of appliance repair leads for our existing clients. So, the quick answer is that yes it does matter. We’re going to talk about our online dominance blueprint image for a little bit and what it show’s you are the click through rates for Google’s search engine results page. So, at the top there you’ll see the paid ads section and then we have the Google Maps section below that, and then the organic results. Now, this is the older image because the search engine results page doesn’t really look like this anymore but it’s still relevant. And the reason why it’s still relevant is from what we’re seeing in all the different states that we have clients. The results are similar.It’s not exactly the same, but it’s so similar that a majority of the clicks are still going to the Map and Organic sections. So even though there’s a section for advertisements above the maps and the organic sections, it seems like consumers are still averse to clicking on them. I believe a lot of people don’t like to be sold. We all like to buy, but we don’t like to be sold. So, there’s still a large segment of the population that are just skipping over the ads and going either directly to the map results or the organic search results. We mentioned on the last slide that there have been some recent changes to the Google search engine results page. So, let’s talk about what actually changed there. They removed the ads that used to be on the right-hand side along the page. Now it only has ads at the top and bottom in some cases or in some cities the number of ads varies. Sometimes you see as much as 4 at the top and then 3 at the bottom. But it could vary. The Google map listings used to be 7 results and now they are 3 results. Definitely a part of that is because Google needs more space to put the ads. If they don’t want to display them on the right anymore, then they need to make room. So, Google minimized the map listing section, and they are also now showing ads in the map results. 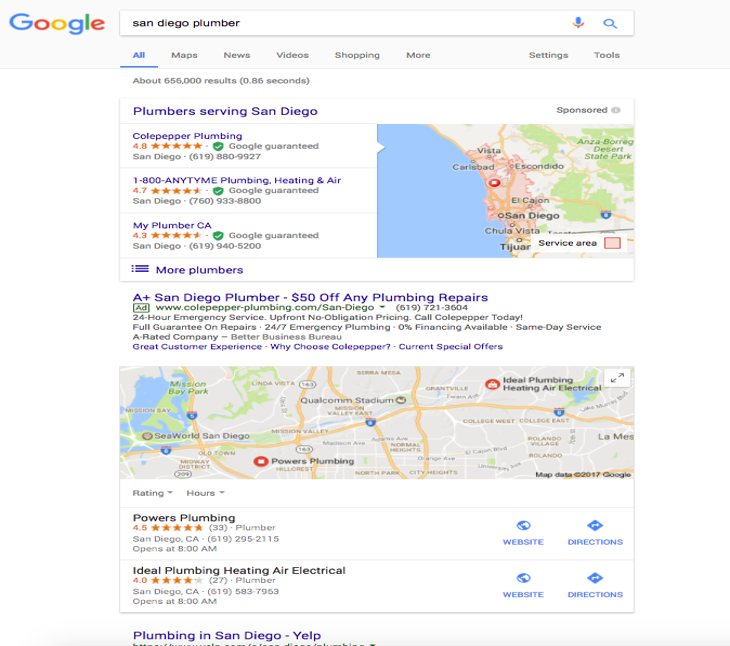 Google is also testing something new called Google Home Services Ad’s in San Diego and other markets near California. Now, this doesn’t affect the appliance repair business at the moment. Since it’s not doing that at the moment, we won’t focus too much time on it. Some of the industries that it’s in, is HVAC, locksmith and garage door repair. Those are the few I can think of off the top of my head. But this is something that’s relatively new and it’s not for the appliance repair industry. But I thought it was worth mentioning because it could be in the future. What that means is that search results for a mobile device are different from if you’re using a desktop computer. If you go to Google on your desktop and search for “appliance repair + your city”, and your appliance repair website is somewhere on the first page on your desktop, and then you try to do the same search with your mobile device, and you’re getting different results, that’s probably the reason because Google has two different indexes. Let’s take a look at an actual example. 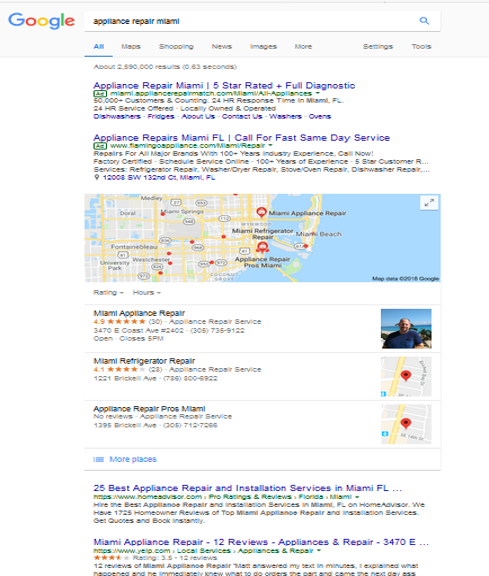 I just did a search for appliance repair Miami. In this case, you’re seeing those 2 ads at the top, there are no ads on the right-hand side. Then there’s the Google Maps listing, and they’re only showing 3 listings now, instead of the 7 that we saw before on that click-through rate image. Then we have the organic search results. We’re only seeing one there. But I’ve seen as much as 3 especially when using a mobile device. Now I wanted to show you this example here of the Google Home Services type of ads. The search term I used was “San Diego plumber”. If you look at the very top of the page, those top 3 ads are the Google Home Services Ads. Then if you look closely there, you’ll see the green badge with the check mark which says Google guaranteed. Those are the Google Home Services Ads, and if you notice they show up above the regular ads. Then you have regular ads, then the map listings and then the organic results. Google is pushing the organic results further down the page, and you are probably thinking if SEO is what we use to increase the ranking of our website in the organic section, is it even worth doing search engine optimization if there are so many ads that are above the organic results??? Keep in mind that consumers are aware that the first few listings they are going to see on the search engine results page are Ads. Remember consumers don’t like to be sold, which I illustrated to you in the click through image above. So they don’t have a problem scrolling down to get to the organic results. Even with all these changes and although it may be too early to tell, but I expect the same results that consumers will definitely go to the maps and organic section over the Paid Ads section. But it’s too early to tell, so we’ll see as the months go by, what the click through rates look like. Don’t forget, the Google Home Services Ads are not currently part of the appliance repair industry at the moment. The appliance repair search results currently only have regular ads then the Google Maps, then the organic results, and there are no home services ads. But I think it’s worth mentioning. Let’s not focus too much time on it, in the event it doesn’t get applied to appliance repair industry. 1. You can no longer use duplicate content. Well, that’s true to a certain extent. It’s not something that we recommend when we do consulting for appliance repair companies that are doing their own SEO. It still works but we’ve seen sites that either don’t rank well with it or they could even get a penalty because of the duplicate content. If you ever heard of the Google Panda Update which they used to run once or twice a year, now it’s become part of the regular algorithm where it’s actually done over 30 days. So yes, you can still use duplicate content on your city pages, but we have gotten away from it. We used to use it probably 3 or 4 years ago where we just duplicated the content for each city page and just change the city name. But we’ve gotten away from it because we feel over the long term Google will crack down on it. We’re starting to see an indication of poor ranking due to duplicate content if it’s not done right, so we wanted to mention it. Since we don’t think it fits into a long-term strategy, we recommend that you use original content. This could be negatively affecting the rankings of your appliance repair website. In the past, some appliance repair companies used to use a virtual office address or they use the U.P.S. store to get their appliance repair business listed in the Google Maps section of the search engine. Google has pretty much cracked down on that and you don’t see too many appliance repair companies ranking in the maps section with those types of addresses, because of that. You can still use your home address, and you don’t have to display the address. That’s definitely still working. But ideally, if you have an office that’s definitely the way to go for that. If Google Home Services Ads becomes part of the appliance repair industry, then you will need to have a physical office address to use and home addresses won’t work in that case. We did mention be careful with duplicate content. Most appliances repair companies serve a 10 to 25 mile radius. So there are a lot of cities and a lot of towns, and in order to rank effectively across all those cities and all those towns, you need to have multiple individual city/town pages. How do you rewrite the content on your home page for each of those cities for 20 to 30 different cities? And that’s what a lot of appliance companies, SEO agencies or even web design companies do, they would just use that duplicate content strategy. So, they only write the content once, and then they just copy it on to all the different city pages. So if your appliance repair website is not ranking as you think it should, you may want to look into this. If you want to check if duplicate content could be part of the problem why your appliance repair site is not ranking well, you can do an analysis check using a website called Copyscape.com. That site will work well to check duplicate content on one or few pages, because all you have to do is enter the domain name of your website and click on search. It’s a paid service, but it’s not expensive and they charge based on the amount of words on the page. So, for a few dollars, you could quickly identify if your home page has the issue. Now if you have multiple pages on your appliance repair website, let’s say you have 20 or 30 pages you may want to use another service, called Siteliner.com. This service will analyze all the pages on your website and let you know if there’s any duplicate content across the web. Ideally you want to have unique content for each of those city pages, but it doesn’t have to be 100 percent unique. You can probably get away with 70 or 80 percent uniqueness. 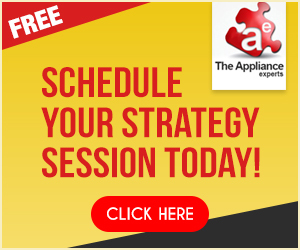 What if you do come across that your Appliance Service Website has duplicate content? You don’t have to delete it necessarily. You can either choose to rewrite it, or you can add additional content to it as well. To help minimize the duplicated content, because remember you don’t necessarily need 100 percent uniqueness, you probably need around 70 or 80 percent to see better results. If you want to test it, you can just try either rewriting or rewording the content on one of those pages and then track the results to see if the rankings change just by doing that. Now if you do that, the next step is to get Google to visit that page so that they can update their index. If you are not sure how to get Google to come to your site and do that, the easiest way is to sign up for a Google Webmasters account, if you don’t already have one. It gives you a lot of insight in addition to having Google to crawl your site. Once you actually change the content and requested the crawl from Google, then give it a couple of weeks to see if the rankings change. Google is taking a lot longer to crawl and update websites nowadays. So, two to four weeks ideally would be good to see if the rankings change. Do you have too many low quality or irrelevant links pointing to your website. A few years ago, it used to be all about links. The website that had the most links is the website that would get the number one position on Page 1 of Google. Google cracked down on that. Particularly the Penguin update addressed this, and it’s now more about the quality of those links and the relevance of those links, than it is the quantity. So, you may want to review your link profile for your website and find any bad links, and to either have them removed or disavowed. You can get an idea of what your link profile looks like with your Google Webmasters Tools, and this is also where you would want to disavow any bad links. You can identify these links to Google and tell them you don’t want to have them associated with your website, which is what disavowing a link is. They are not going to remove the links, but they’re basically going to re-categorize them from a do follow link to a no follow link and then it won’t negatively impact the rankings of your sites. The disavow process is all you need to do, but if you also want to get them removed you’d have to actually contact the website owner that is linking to your website and ask them to remove the link, which sometimes can be a challenge and Google knows this. That’s why they have the Disavow Tool, for website owners to discredit those links in the event of that type of situation. Now something to keep in mind, if you just have a Website, you can still get links even if you’ve never tried to get links. That is just how the web works. There are companies out there that are scraping information online and are always looking for different websites to link to. Let’s say there’s a new appliance repair directory. They will want to find every single appliance repair company in Houston. So they’re going to go to Google, and they’re going to actually go through every single page and list every single appliance repair company and then they’re going to take that information and put on their appliance repair directory Website. Then that’s going to link back to your site. But that could be a low-quality link. While it may be relevant, it’s a new directory. Who knows what types of links are pointing to them? It could be a low-quality link that you’ve received even though you’re not trying to get links that way. So, it’s good to check your link profile as part of your monthly or quarterly strategy to take a look at the backlinks that are pointing to your Website and see if you notice any low quality links. You can then disavow them or contact owners of those websites that are linking to you and ask them to remove them. As part of your monthly appliance repair SEO strategy, you continuously want to work to diversify the anchor text and build more high-quality and relevant links for your website. The reason you want to have multiple anchor texts is because that’s how you get your Website to rank, for hundreds if not thousands of different appliance repair keywords. Google Maps has a major change with the Google Penguin update, and it primarily addressed the local map listings. It took a major toll on appliance service companies that were using fake addresses such as the U.P.S. store, mailbox, etc., They were the main ones that really got affected by google is trying to get more real physical business address in the map listings. But since the appliance repair industry is a service area business, and that’s just a fancy way of saying appliance repair companies provide service at the customer homes, Google allows appliance service companies to use their homes. But Google also understands that most appliance repair companies don’t have an office for consumers to come to and is referred to as a service area business, so they know that a lot of appliance service business owners operate from home and then they just have technicians that go out to the consumer’s address. That’s why the home address is still working and it probably will continue to work because they really do understand that appliance repair is a service area business. If you’re doing your own appliance repair search engine optimization and you’re doing it the same way you used to do it four or five years ago, and you’re not seeing the results, it’s probably because of what used to work in the past is no longer working today. In the Panda, Penguin and Pigeon era, it’s all about the user experience now, and there’s something referred to as user experience optimization, which is now part of effective search engine optimization. You typically hear of On Page SEO, Off Page SEO and now there’s user experience SEO. 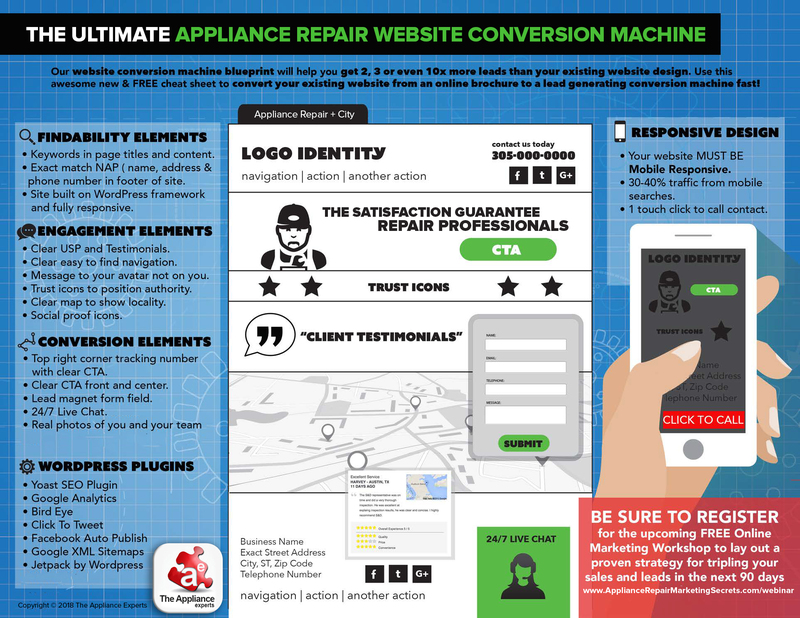 The new appliance repair SEO formula requires a heavy focus on user experience. This is because Google is primarily focused on the end user. If the consumer goes to Google’s search engines looking for an appliance repair company, they want to make sure they are delivering exactly what the consumer is searching for. So as a result, they track what the consumer is doing, and if they realize that the consumer is not finding what you’re looking for, then they’re going to change who ranks where on the first page of Google. Do they scroll down on the search engine results page and which website do they click on there? Then when they click on that website what do they do next? How long do they stay on that website? Are they watching a video on the website or are they clicking on links on the website? These are all things that Google are tracking, including whether the consumer clicks the back button, which would indicate that they didn’t find what they are looking for. Google is tracking all these things. If that consumer now goes from Google to let’s say Bing or Yahoo, they’re paying very close attention to that because that’s definitely not what they want to happen. So click through rate is key when it comes to user experience optimization. They’re also looking at the scroll rate. Are consumers scrolling down once they get to your appliance repair website? Are they clicking on links? The amount of time that they spend on your website is a big deal. This is where you want to track the bounce rate of your website, which is how long the consumer stays on your website before leaving. Do they come to your website and then leave? Do they leave in 10 seconds, 20 seconds? Ideally you want each visitor to your website to be spending 3, 5, 10 minutes or more on your Website. Now how do you track things like the bounce rate, time on site and click through rate? You can track it with a free tool from Google, and it’s known as Google Analytics. You can just type that in the search engines to find the link to Google Analytics, and I highly recommend that you get it now, so you can start looking at these factors. Because these factors can and will negatively affect the performance of your appliance repair website. Another reason these factors are important is because they can rank you on page 1 with less links. If you can get this part right, you can use a lot less links to get onto the first page. A good number of reviews, relevant links and a good click through rate score are pretty much the new ranking factors that you want to focus on. You want to figure out also what the most important appliance repair keywords are. That’s based on your service area and you also want to pay attention to the search volume. Now how can you find out the most important keywords in your local service area. Well, one of the free tools again is from Google, who does provide a lot of free tools that you can use to improve your online marketing. To get access to their keyword planner, you do need to set up a Google AdWords account. You don’t need to run ads, although if you do run ads with Google AdWords you’ll get access to a lot more details but all you need to do is sign up for a free account. They may ask you for a credit card, but if you’re not actually running ads you’ll never be charged for anything. So that’s how you can get access to Google’s keyword tool, and you can of course just search that in Google to find a link to it. Set up a great website with unique pages to target those appliance service keywords. So, once you have the keywords that you want to target you did a search using the keyword tool, to get your feet wet with keyword research. 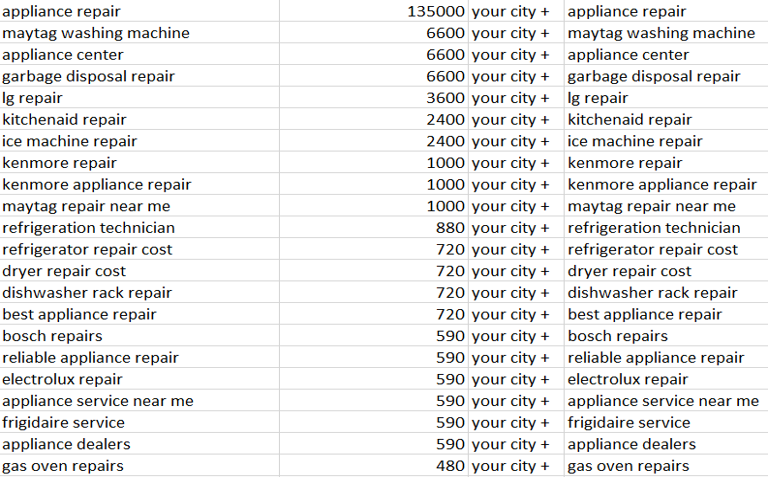 Now you know which appliance repair keywords are actually getting the most clicks. Now you need to create pages with those keywords. So, you can start showing up in a search engine when someone types those keywords in your local service area. And you also want to have pages for each service. For each city, you want to optimize your website for user experience. Then you want to optimize for SEO which includes on-site optimization. You also want to build authority by using offsite optimization and then next you want to track the results. So, you should be looking at your results monthly at a minimum. If you create new pages, you need to know where those pages are ranking in the search engines, because if the rankings increase that also results in more appliance repair leads. There’s definitely a lot more and some of that will apply to you while others won’t. You know for example if you don’t service Bosch appliances, then you know those definitely won’t matter to you. The second column represents the search volume. You may be thinking some of those numbers are pretty large especially the first, but it’s because it represents a nationwide average. 135,000 searches gets done on a monthly basis for appliance repair across the U.S.. You can get a list of the top 50 appliance repair keywords by clicking here. Just to review, you want to have a strong website with good content and that has a good user experience. You want to also leverage multimedia to improve the on-page time. Having multimedia is one way to improve the user experience. We went into this in a little more detail on the webinar last month, which you can find on our YouTube channel. The 2018 Online Marketing Plan is the name of that webinar, so that’s what you’d be looking for. But leveraging multimedia especially video, will help keep the consumers on your website longer. That’s because for them to take time to watch the video takes a few minutes, but you don’t want a long video. Just having something for a couple of minutes is ideal. What type of content should you make those videos about…? You could have a video of the owner of the appliance repair company welcoming them to the Website talking about the different services and brands that your company specializes in. You can even introduce your team members and the different technicians that will be coming out to their homes. All those things will help you with user experiences. And then you want to have different pages for each of the different services. So, you could have one page for refrigerator repair, another one for dishwasher repair, another one for stove repair and so on. Don’t just list all the services on one page and you want to have multiple pages for each of the different cities that you service. So yes you’ll have one page for the main city but then there’s all those different towns or suburb areas that you want to create pages for, because that’s going to help you rank a lot easier than trying to get just one home page of your website to rank for 20 or 30 different surrounding towns or cities. Again, we do recommend that you have unique content. You also want to have customer reviews on the City pages as well, as those will help with those pages not only ranking easier, but it will help with converting more visitors to those pages into actually customers. Ideally you want to get reviews that are on Google, Yelp or Yellow Pages and actually get it onto that particular city page where the appliance repair service was completed. All these things are great signals to Google to rank higher, as well as consumers who are looking for reviews nowadays before they actually pick up the phone to call. Reviews are another way to improve the user experience. Unique content on every page. The main keyword that you want to rank each page for should be both in the title and in the H1 tag. The keyword that you want to target must include the city name, such as appliance repair + city or refrigerator repair + city. For example, if you’re in Dallas, you can have ‘Dallas appliance repair’ or ‘Dallas dishwasher repair’. A surrounding city that you may target around Dallas would be Garland Texas. So ‘Garland appliance repair’ is what you want to have in your title and H1 tag for your Garland city page. Then you have the Meta Description that really sells the click. Now, this is important once you get onto page one of Google as the Meta Description is where you want to put the Call To Action because consumers actually read it before deciding to click on your listing. So why should the consumer click on your website vs. all the other websites and ads on the first page? Is it because you have the best service in town? Is it because you offer a free estimate if they go with the repair? Those are just a few things you may want to consider putting into your Meta Description to convince the consumer to click on your website. Now, this can be very effective, especially if you’re not necessarily in a number one position on page one. So, let’s say you’re on page one but you’re in number two or number three position, then by optimizing the Meta Description of your website, you could get more consumers to click on your website versus just immediately clicking on the website that is in the number one position. Then you want to have the name address phone number and footer. 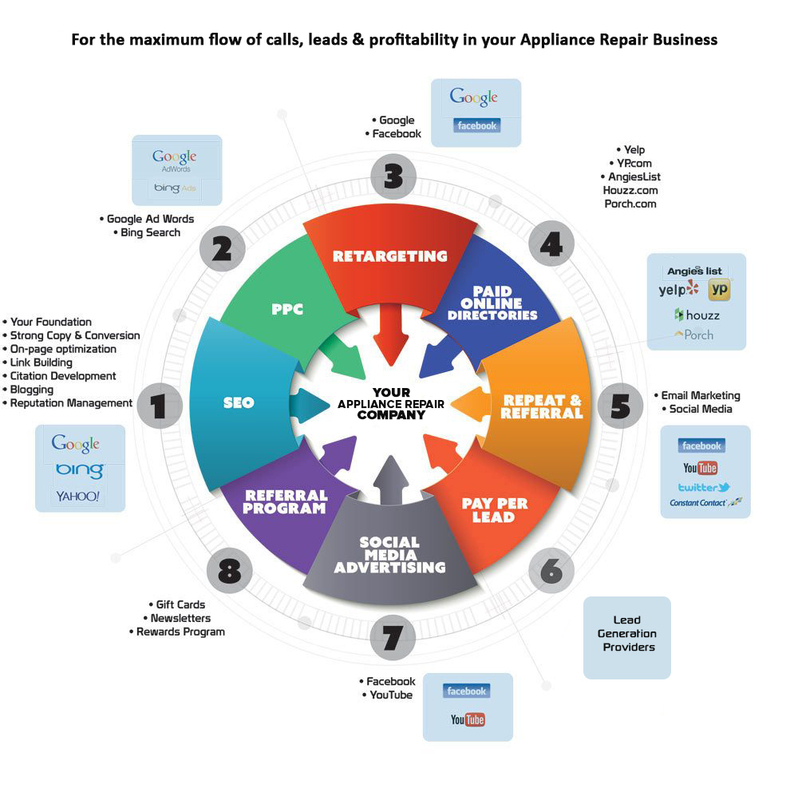 Consumers are looking for the contact information and they want to see where your appliance repair business is located. They want to see how close you are to their home. So that’s why that’s important. And then you want to do blog posts or write articles on an ongoing basis to keep your site updated. The blog will help to not only keep your site updated, but blog posts that are optimized correctly can also help you to rank for additional keywords. Why isn’t my refrigerator cooling and the possible causes? These are all great resources because consumers that are having these types of issues with their home appliances are not necessarily going to just type in “appliance repair” in the search engines, which is probably the most common search term that most appliance repair companies target, but instead some consumers are going to type in the problem they are having such as “refrigerator is not cooling” or “oven not getting hot”. You want to rank for such keywords like as well. So that will summarize on-site optimization and below is another image that we discussed in the last webinar. But it’s worth bringing up again because these are the different things that you could use to improve the on-page optimization and the user experience. All these things will help to get more visitors to your site to call your appliance repair business. On page search engine optimization is important, but if you’re on Page 5 – 10 of Google then how do you get to the first page? This is where off page SEO comes in, to get your website closer to page one so that you can start to get visitors to your site. At that point you can start optimizing for user experience. Did you set up your Google My Business Listing? You do that so that you can start ranking in the map results. Once that is done, the next step to improve your rankings is to start getting a lot of citations across the web. That’s primarily from local directory sites like Yelp, Yellow Pages and your social media sites like Facebook. You want to leverage tools. If you don’t want to do it manually, then you want to leverage tools like Review Buzz, Customer Lobby and Birdseye. There are several tools that can help you with this, but you can do it manually. But the important thing is that you want to start getting reviews from every single customer that you provide service to. If you’ve ever watched any of my videos or read any of my blog posts before, you will notice that I am a strong advocate of getting reviews. I talk about how important reviews are and how even more important reviews are going to be in the future. We are already seeing a pattern where consumers want to read reviews before calling an appliance repair company. This is why Yelp is as big as they are. They’re a multi-million dollar company now, and it’s all based on consumer reviews. They saw that pattern years ago and they created a website based around consumer reviews, and now they are multi-million dollar company. And I’m telling you reviews are going to become more and more important as time goes on, if you take away anything from this article today it’s that you need to get on top of collecting customer reviews on a regular basis. So, every single customer that you provide appliance repair services for, you should be asking them to leave a review. And it doesn’t matter which review site they leave it on and they don’t have to leave it on every single site. Which Review Site Is Best? Google is definitely my number one choice and then Yelp would be the second choice. My third choice would be Facebook. Most of the other sites now pull reviews from those three, so those are the three you want to focus on. But if you want to focus on one, it should be Google. Now you’re not going to please every single person, Right? Someone’s going to write a bad review about your appliance service company and that’s ok. That’s just how it is. The important thing is that you get more good reviews than bad. If you only had good reviews and no bad ones, then consumers would actually wonder how legitimate your reviews are. You always want to respond to the reviews. Actually you want to respond to all reviews whether good or bad. If you get a good review, you can just write a short note thanking the customer for choosing your appliance repair company, and let them know you understand they have a lot of choices when it comes to appliance repair, and you’re happy that they chose your company and you look forward to serving them in the future. That is an example of how you could respond to a good review. When responding to a bad review, never blame the customer even if they are to be blamed. Instead take responsibility for the bad outcome. I always recommend to my clients to refund the customer their service call fee, if they think that will solve the problem. In most cases it will. Not refunding the customer their money is not worth a bad review. Bad reviews are going to cost a lot more in new business in the future. All you need are primarily a lot of relevant and authoritative citations and customer reviews. Those are the top two things that you need to focus on. Once you set up your Google My Business listing, you’ll see your rankings climb into Google Maps just by focusing in on getting new citations and getting those reviews on a regular basis. So, let’s start with authority links. Most directory sites especially the major ones, those are authority links. Yelp is an authority link, Yellow Pages is also considered to be an authority link. And then there are authority social media marketing sites like Facebook. Local appliance repair associations like the United Servicers Association and Professional Service Association. If you could get a link from a manufacturer, let’s say you are an authorized vendor for G.E. or Whirlpool and they link back to your website, those are also really good authority links and they are also relevant. A link from an appliance repair directory site is considered relevant. And then there are online article sites. So, if you publish an article about appliance repair and then link back to your website, it will be considered relevant. A press release about your appliance repair company is considered both authority and relevant because they’re typical newspaper or news station websites. And if you publish monthly blog posts, other websites will pick them up and republish them. You’ll get authority and relevant links back that way as well. Another way to find authority links would be to analyze the competition on the first page. You’d need a software to do this, one of them that I would recommend is majestic.com, Majestic allows you to input your competitors that are ranking at the top of page one and they will show you most of the links that your competitors have pointing to their appliance repair website. This software costs around 40 bucks per month, depending on the subscription you choose. Once you have the list of your competitors’ backlinks, you can now contact the owners of those websites to see if you can also get the same links for your website. As you analyze your competitors’ websites and their backlinks, you need to understand something called Trust Flow. Trust Flow is measured on a scale from 0 – 100, with “0” meaning the site has no Trust and “100” meaning it is the most trusted. So the higher the TF, that will indicate if it’s an authority link. Then you can just look in the domain name to see if it has anything to do with repair or appliance. That’s how you could identify relevant links that your competition has, and then you can just contact the website owner to see how you can get a link from that website. Learn from your competitors who are already on the first page of Google and replicate what they are already doing. If you were to take a look at the top three sites on the first page of Google, there’s a few things that you’ll notice that they all have in common. First, they all have in common a claimed and verified Google My Business listing. Google used to have what’s called a blended algorithm. So usually those three companies that will show in the in the top 3 map listings are also the same 3 websites that are at the top of the organic results. This however, is not always the case any more as the blended algorithm doesn’t really work as it used to. But if you do analyze to see if those top 3 websites in the organic section to see if they have a Google map list and in most cases, you will see that they have one. So that’s why I would highly recommend that you set up your Google My Business listing if you don’t already have one. Remember you can use your home address and you’ll have the option not to display the address in the Google Maps. I highly recommend that you at least get this step going and you’ll start to see some improvements in your organic results. 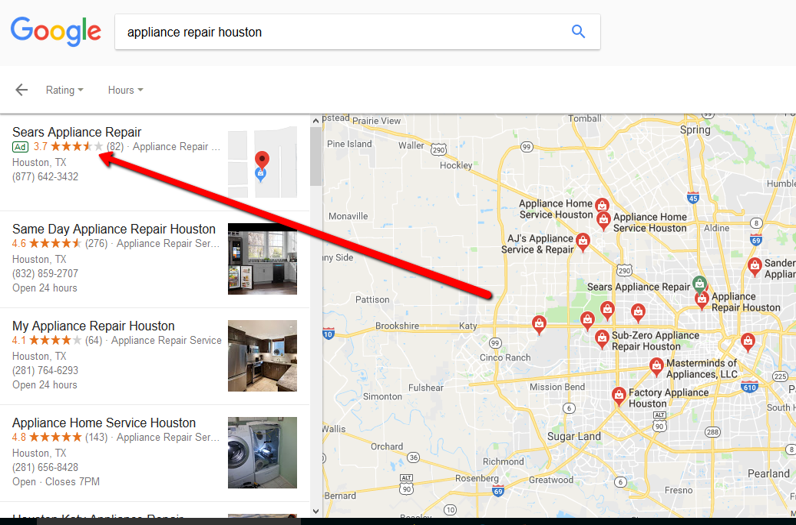 And as well as you’ll get more appliance repair leads just from being listed in the map results as some consumers go directly to maps section to find an appliance repair company. If you’re setting up your GMB listing for the first time, use your real company name, try to get a keyword in their as that is considered spammy in Google’s eyes. Example, don’t do appliance repair Houston when your company name is dependable appliance. While using a keyword instead of your real company name might still work, we don’t recommend it as a long-term strategy. We’re always thinking long term and we want to get lots of online reviews, and as a reminder getting online reviews should be part of your daily routine. Just like your daily routine maybe to order parts or to stock your trucks, online reviews should be part of that as well. Keyword in the title tag. The main keyword “appliance repair + city” or some variation of the keyword can be found in the title tag of the top 3 ranking websites on page 1. From those directory sites, and social media sites that we talk about and the N.A.P information needs to be consistent across all sites. What does N.A.P stand for? All those should be consistent across all citations. So capitalization and spelling matters. If you use an uppercase letter in one citation you want to use it in all the others. Let’s say your company address is 123mainstreet. If you spell out the word “street”, you want to keep it consistent and spell it out across all the other citations. So don’t use the abbreviation “ST” for street on some and then spell it out for others. All those “little” details can affect the rankings of your Google Map listing. You want to have a solid link profile across the web. We talked about this earlier, where you should take a look at your links monthly or quarterly to see what type of links are actually pointing to your Website and if it’s a low quality link, you should try to remove it or disavow it as it could be affecting your rankings. We’ve covered a lot of information, so let’s go ahead and review now. The new Search Engine Optimization Formula for this year is to set up a great Website with pages for each of the different services. The additional pages will help you rank for more appliance repair keywords than if you just had one service page with a list of different services. You also want to have pages for each of the different surrounding cities and towns around your main city that your service. Identify the best appliance keywords that you want your website to rank for in your local service area, once you identify these, you should take a look at the search volume and and add your city to it, and include your main keywords in the title and in the h1 tag of each page. Use unique content on every page. That’s what we’re recommending. Leverage multimedia on your websites such as video and images to increase the amount of time that a consumer will spend on your website and if you don’t already have it, sign up for Google Analytics and you realize that you have a very high bounce rate, you can addressing that with the videos and images of the technicians, the owners, the team and the vans are all things will help reduce that bounce rate. Then you want to make getting online reviews a regular part of your daily strategy, which I highly recommend, and you want to get these reviews across different websites right. Some consumers will prefer to do Yelp because they already have a yelp profile and that’s fine. The important thing is that you’re asking for their reviews on a daily basis and then you want to build citations consistently. You’re not going to get hundreds of citations all at once. I recommend that you maybe get 20 – 30 the first month and each month you get another 20 to 30. You want to post updated content on an ongoing basis and you do this by creating monthly or weekly blog posts. This will help you to rank for hundreds, if not thousands of keywords. You want to build links, relevant links and authority links is what should be building constantly,and this should be a monthly plan.When it comes to Link Building or ling acquisition, you want to be choosy with those links. So, make sure they are from high authority sites and make sure they are relevant to the appliance repair industry. Relevance would mean it’s has something to do with appliance repair, or the website should be have something to do with real estate, homes, houses, electronics or appliances. 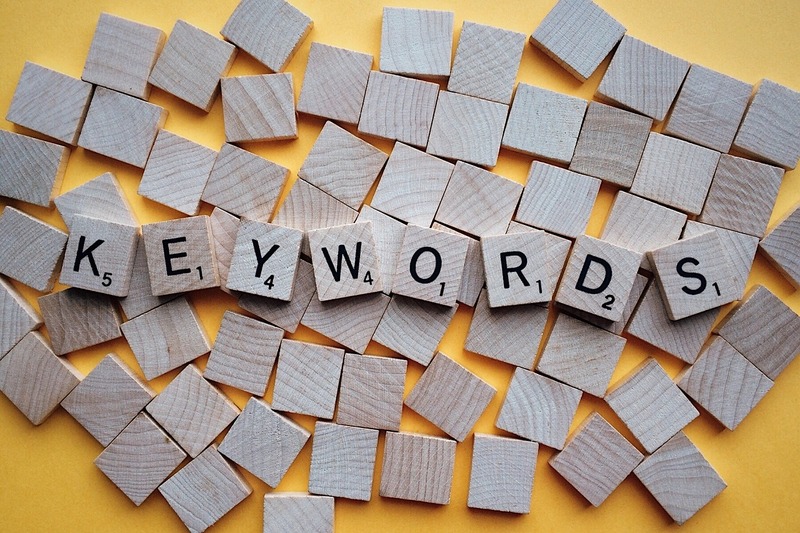 Leverage paid search to identify high converting keywords. So what we’re referring to is by doing some type of pay per click advertising, you’ll be able to identify some keywords that you can now use for SEO. Track your progress and results. You want to get Google analytics to track the on-site user experience. You can use Google Webmaster Tools to track your rankings for some keywords, as well as to analize the links to your Website, but keep in mind it’s not going to show you every single link. There are paid tools that you can use like proranktracker.com, which will track where your website is ranking in all the search engines. Bright local is another rank tracking tool, you can sign up for a brightLocal.com. You also want to consider using call tracking services, and we’ve talked about this a lot in past videos and articles. Some companies that you can use for call tracking is callrail.com, callfire.com and servicetitan.com. Call Fire would be probably one of the most inexpensive way to implement call tracking. As a reminder call tracking is a way for you to track your advertising, so you can know what’s working and what’s NOT working. It’s also going to help you track the amount of appliance repair leads you get from one source such as SEO versus the amount that you got from pay per click advertising and also yellow pages, and then you can maybe choose to invest more money into the ones that you’re getting a lot more leads from. If you have read this entire article, we want to reward you with a free 2018 search engine optimization review, where we’ll take a look at your online visibility. We’re going to talk about the different keywords that you should be targeting. So, we’re going to look at some of the keywords you should be targeting specifically for your local area. We’ll look at the rankings of your Websites. We’ll look at the different online directories that you’re listed, and we’ll see if your company name, address and phone number are consistent across those. We’ll also take a look at your online reviews if you have any and if you have any bad ones are you responding to them. So, we’ll review your overall online reputation. And then how effective is your Website conversion and we can talk about some additional user experience factors during that particular Website conversion segment of the call. If you would like to have our team take a look at your current SEO Strategy and let you know where may be room for improvement and discuss the possibility of working together to make 2018 your best year ever in the appliance service industry and finally get your lead generation right. Then schedule your FREE search engine optimization evaluation now. United Servicers Association and Professional Service Association.